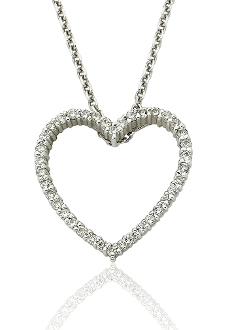 This romantic and trendy Diamond Heart Pendant is attractively designed in 14 Karat white gold and studded with a row of sparkling Diamonds, totaling 0.40 carats. This gorgeous piece comes complete with a 16-inch cable chain that is secured with a lobster claw clasp. The heart is a symbol of love and happiness, this sweet Diamond Heart Cluster Pendant is the best jewelry for all occasions and attire. Nothing can be lovelier than this beautiful fine Diamond jewelry.